I laced my boots in my hotel room in Kathmandu, and stood up. My feet felt indestructible. 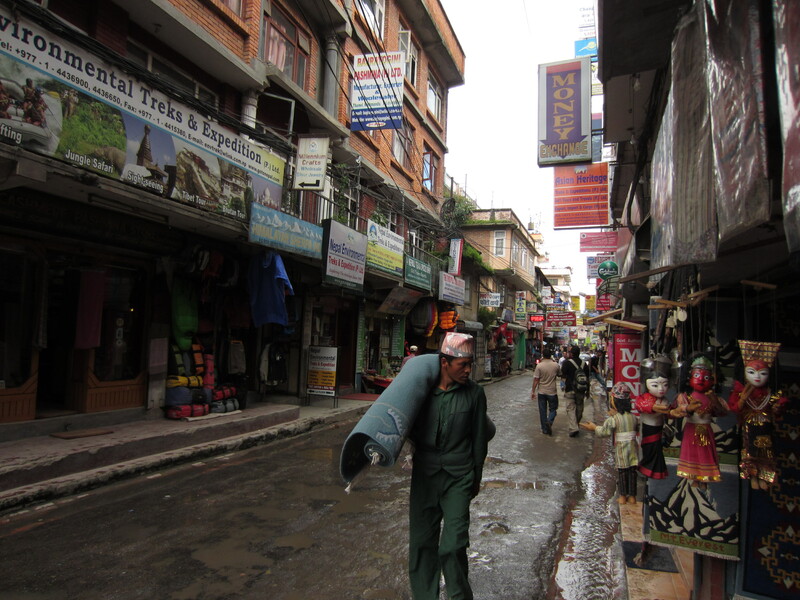 They were rentals from a trekking shop in Thamel, bulky leather constructions that looked antique. This district was popular with trekkers, a labyrinthine beehive of muddy, splashing potholed streets, sleeping cows, Hindu shrines and vegetable carts. As cars, sport bikes and bicycles wriggled past each other, displays of coloured jackets and backpacks faced off against traditional woollen beanies, pashmina scarves, and leather bags. It was 7am, and time to leave. I brought my huge black backpack, only half filled and strapped down absurdly so that it was almost folded in two. It was heavy, but manageable. The official start of the Langtang trek was the small Himalayan town of Syabrubesi, nine hours from Kathmandu by local bus, overcrowded, smelly and with plenty of roof-riding passengers. Twice we disembarked from the bus and hiked for near an hour to the next bus, in places where catastrophic landslide events had destroyed the road. Boulders from football sized to the size of houses littered the slope. 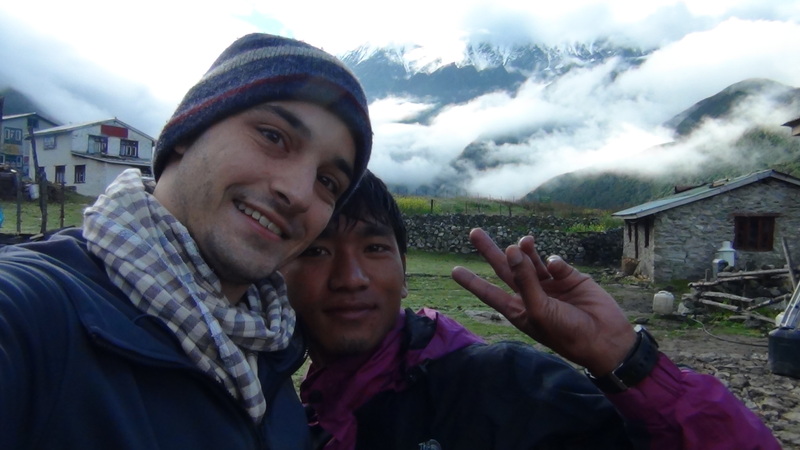 I was with Nava, my guide, a young Nepali man who knew the mountain well, my companion for 8 days. We started the trek as the roosters crowed and the rest of the town rubbed the sleep from their eyes. Armed police checked our permits at the checkpoint and we began to walk. 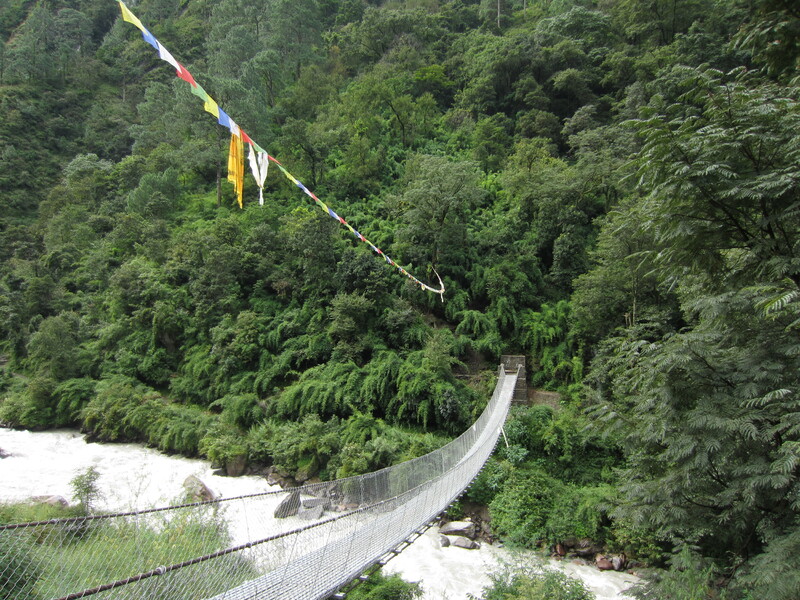 I had a spring in my step as we crossed the first river bridge and marched up the first hills with enthusiasm, passing through small Nepali towns built of unmortared stone. We followed the river up, a softly rolling thunder of whitewash. All around us, great mountains bristling with pine trees dwarfed the valley. The rocks beneath my feet sparkled with some sort of metallic glitter, and Nava pointed out marijuana growing wild. Soon we began to climb. Always following the rushing river of snowmelt, the landscape thickened with jungle, the trees grew giant and ancient, a thick coating of moss covering every surface. The climb arced upward up staircases of stone, slipping slopes of soil and gravel, and up sections where the trail was just a river. Nava urged me to cross landslide zones quickly and cautiously, as boulders could fall quickly and without warning. Some landslide areas had dropped boulders the size of houses, and I imagined the noise such an event might have made as it crashed into the river. My boots turned to lead with every metre we ascended, until my legs ached and I needed to summon my strength to take each step. Small hotels and restaurants punctuated the trail, and we paused occasionally to eat or rest. The air was crisp and cool and smelt of water, rain and ozone. After lunch the trail became hugely steep, and a belly full of rice didn’t help my climbing. The ascent was relentless. I huffed and puffed, and shook my head in disbelief as the staircases stretched high up into the trees. The cool air kept our drinking water cold, and during rest breaks I watched the steam rising from my arms. 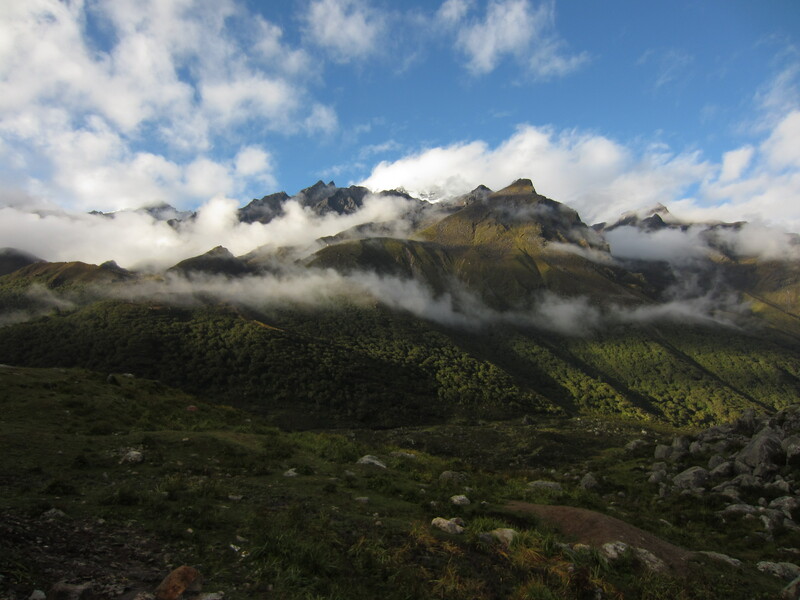 As I neared the top of the day’s climb, my vision blurred and my hands tingled from the altitude. At Lama hotel, our stop for the night, I collapsed in a heap. Lama hotel, a trekker’s favourite along the Langtang trail, was a large, square building of stone and timber, with basic dorm rooms, showers, and hot meals. A handful of Trekkers on their way down the mountain were doing laundry, and I greeted them. There were very few western faces on the trek. I had a meal of Dhal bat, a simple Nepali rice dish (with it’s own catch phrase, Dhal Bat power, 24 hour!) served with a lentil sauce and a mild vegetarian curry, washed down with Raksi, a home made wine that tasted of watered-down Sake. I slept easily in my sleeping bag, exhausted. The next morning’s air was so crisp and still, it could have been cracked with a hammer. I huddled over a hot coffee and a steaming bowl of porridge with honey, and tied my boots to begin. My body loaded with carbohydrates, I was eager to start the day’s hike. The uphill section began immediately through an ancient jungle of towering sentinel trees, blanketed heavily with moss. Our shoes gave a soft squish as we trod through puddles of sucking mud and decaying leaf litter, and endless staircases of boulders. After a short time, the trees shrank away to welcome beautiful groves of close set trees blossoming with flowers, and whispering streams of icy snow melt. Past the forest in the valley, rolling golden hills of grass, awash with wild mountain flowers of sunburst yellow, tall stalks of crimson, shining petals of brilliant blue, and daisies of vivid purple decorated the landscape. With the incredible mountainous peaks and waterfalls surrounding, this was The sound of music, with a dash of The Shire from The Lord of the rings. My thoughts were not alone; I laughed as we passed a small restaurant named The Hobbit. Despite the beauty, the altitude continued to tick upwards without remorse, and under the strong sun of the day, my legs turned to jelly. 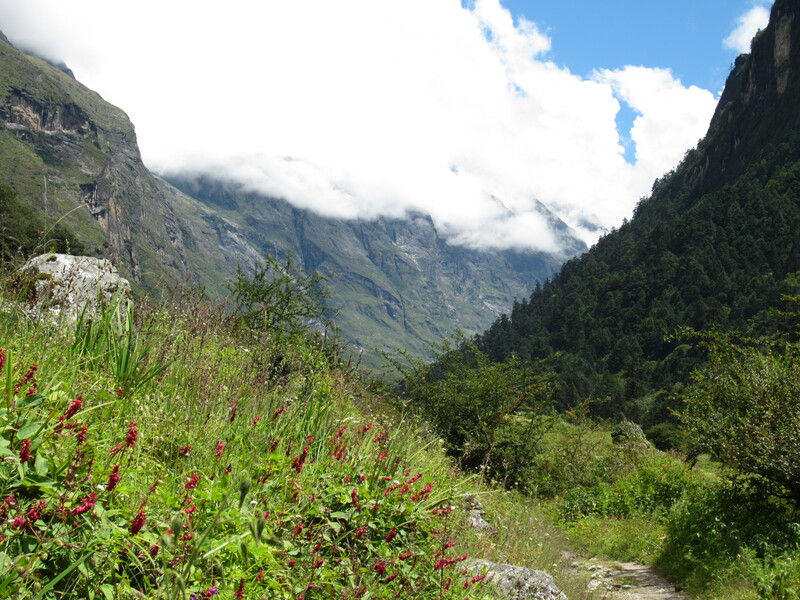 I began to trip over my feet more and more as the small town of Langtang appeared in the distance. We arrived early in the afternoon, thirsty and desperate for a shower. The town seemed to just be a cluster of guesthouses, and most were deserted, with peak trekking season still a few weeks away. 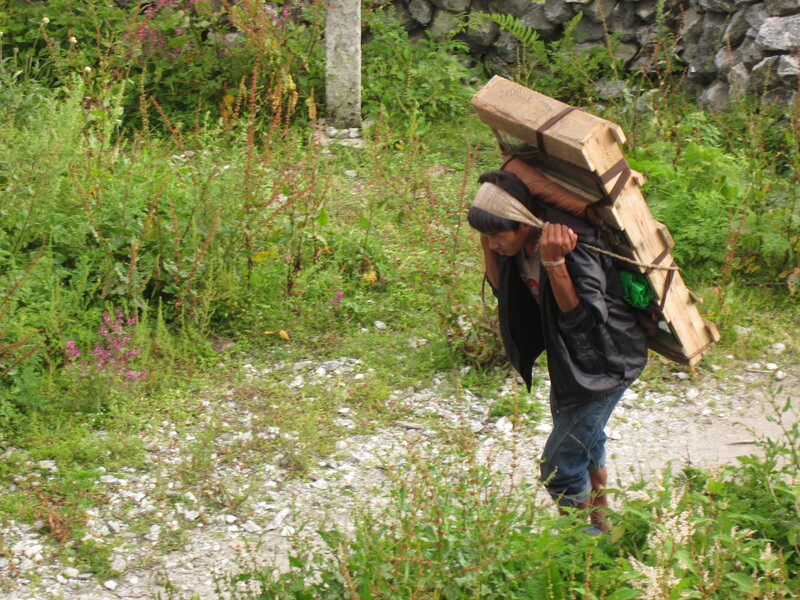 I had a cup of tea and watched local porters trudge past, hauling incredible loads of food, drink or building supplies in baskets supported by their foreheads. The trek to Kyanjin Gomba the next day was just 3 hours. This high up, the morning was icy cold, and we walked with our warm jackets to protect us. Small communities with stacked stone houses, low walls and fields of red buckwheat disappeared a short time after Langtang. The large trees, plants and flowers all thinned to be replaced with perennials, shrubs and bracken, and cold slate boulders. The path was a writhing snake draped across the shoulders of the valley, flowing up and down in elegant waves, the white river rushing in the valley far below. Near the top, hardy green ground coverings were all the vegetation that remained amongst the fields of grey boulders and white sand that seemed as cold as snow. A group of porters overloaded with supplies were herding a donkey down over the hill. We passed them, and arrived at a viewpoint, pausing on the crest. Kyanjin Gomba was spread out in the next valley, a small medieval town dwarfed by mountains and clouds, the urgent rush of the river drowning the sounds of carpentry. I felt a great sense of relief. Nava woke me just after sunrise the next morning to show me the mountain range. The view was always clearest first thing in the morning, and from my hotel, we could see the frozen, snowy peaks of the jagged mountains around us. To the north was the glacier, a great frozen river, a million diamonds and sapphires cascading down between the peaks. The clouds danced and swirled as they drove in quickly, playing peek-a-boo with the earth. Nava pointed to the big grey-green peak closest to us. “This morning, we’re climbing that one”, he reminded me. It was Kyanjin Ri, the object of the trek, 4773 meters tall, and on the distant peak, a tiny collection of flags fluttered in the morning breeze. The way was a zig-zag up crumbling soil, lose stones and wiry green grass. I climbed with hands and boots, steadying myself on the slope which seemed near vertical. Even without my backpack on, it was very difficult. A dozen times we stopped to rest, and a dozen times I felt like turning back. After about an hour and a half, the altitude was making my head ache, but I looked up and saw the peak clearly, long strings of flags of red, blue, yellow and white at the end of the curling rocky path. We were nearly there. Nava and I stood at the top of the mountain and high-fived. The clouds had gusted across Kyanjin Ri during our climb and threatened to steal the view, but we were above the clouds now and the world was crystal clear. The glacier poured in a huge, blue, frozen wave right in front of us, and the mountains around us glowed white with tips of snow. I threw my hands up like Rocky Balboa after a training session. I climbed a mountain! Climbed a mountain! Only half the size of Everest, but it’s a start! Check out the glacier in the backgrond. And the guns. We chased a stream of rolling pebbles as we descended quickly, arriving back in Kyanjin Gomba a short time later. I liked it here, a small, serene community with herds of yaks mingling around the simple houses, whilst locals sat around, talking and smoking. We sat down for lunch, but my throbbing headache made Nava worry, a bad symptom of altitude sickness. 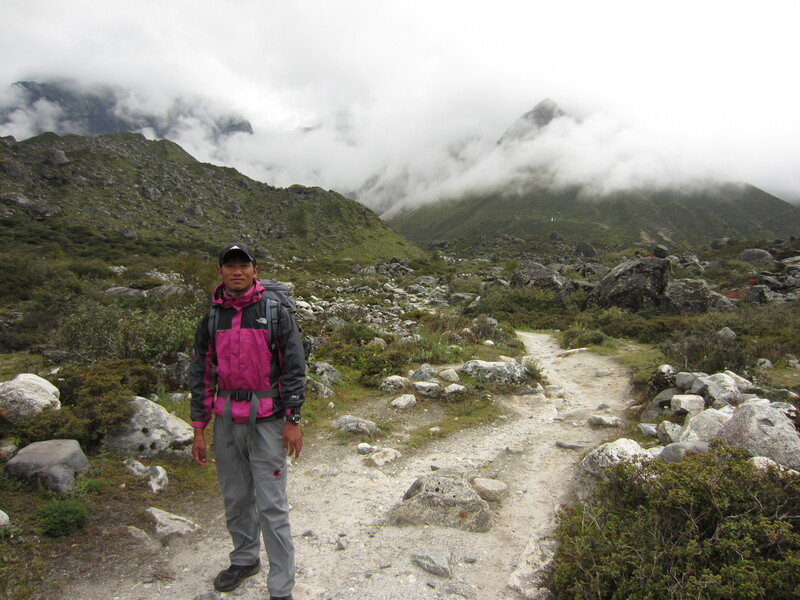 When it didn’t improve after a short time, Nava made the decision to descend earlier than planned, 400m back to Langtang. Coming down the mountain was a world easier than ascending. 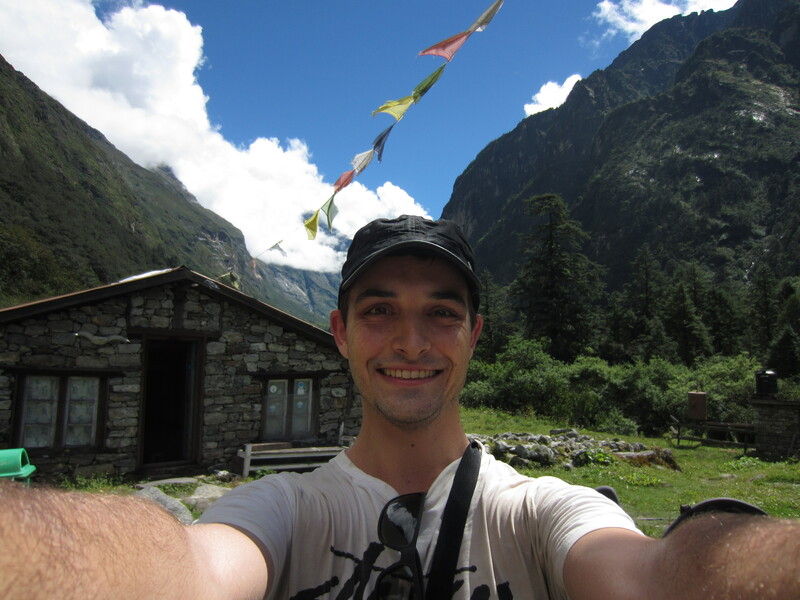 After a rest in Langtang, my headache felt better, and by time we descended to Lama Hotel the next day, I felt great. I was amazed by seeing the trail in reverse, and just how steep we had climbed. Some days we added a kilometer of elevation to our altitude. It was fast coming down, but slippery and a strain on the calf muscles. I met another trekker on the way down who said the elevation had given her a nosebleed. Within 6 days of walking we had reached the top of Kyanjin Ri and come back down to Syabrubesi. I felt fit and healthy, with an enormous sense of achievement and accomplishment, an appreciation for the hardships of a mountain people, and a respect for the challenges of mountain climbing. 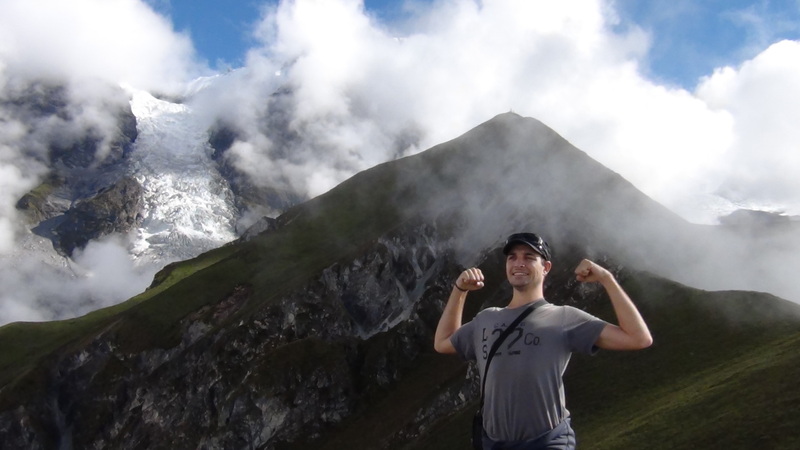 The total climb was about 2,400 metres in elevation. I celebrated with Nava with a cold Everest beer! Thanks for the post. We plan to do the same route in March 2014 so it is good to have insider info. Cheers. No worries mate, check out Adventure Mountain Explore, it’s the company I went with. Highly recommended! Have fun! 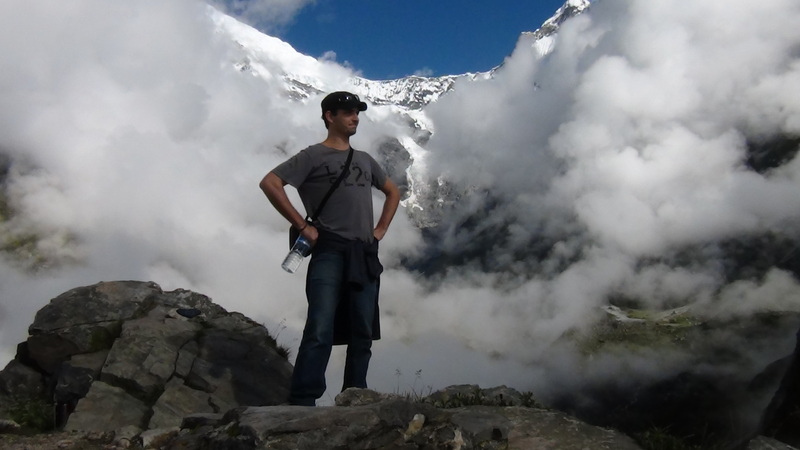 In March 2014 I did the Annapurna Basecamp Trekking and in November 2014 I did the Langtang Valley trekking with the team of Sanjib Adhikari. It was a great experience! They took very good care of me and I always felt very safe! I can highly recommended the team of Sanjib Adhikari.